One of the best-known Danish poker players, Team PokerStars Pro Theo Jorgensen, was shot in the leg three times, after masked gunmen broke into his home and demanded money from Jorgensen and his wife according to reports from Danish newspapers, and a post from Theo himself on his Facebook page. The home invasion is the second such instance involving a well-known poker player in the past year –last year it was 2010 WSOP Main Event winner Jonathan Duhamel who was beaten and robbed at his house outside of Montreal. The incident involving Jorgensen was first reported by the Danish newspaper Ekstra Bladet where a scary picture was presented. According to the report, three men forced their way into Jorgensen’s home about 20 kilometers outside of Copenhagen at around 10 PM local time on Sunday, December 2. The men, dressed in “elephant masks” shot Jorgensen in the leg three times before his wife retrieved whatever cash they had in the house (which was reportedly a five-figure sum of Danish Kroners). When the assailants left the scene Jorgensen’s wife called police and Theo was taken to the hospital where his injuries were treated and considered not life-threatening. Police are searching for three suspects, all between 170-180cm tall (somewhere between 5’6” and 6’ tall) with average builds, one of the suspects may have been armed with what is being called a sub-machine gun. At the time of the robbery all three men concealed their faces and were dressed in dark gray clothing. 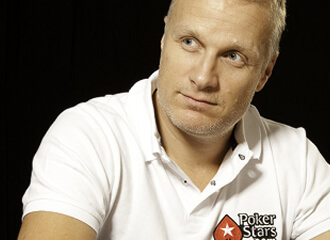 Eerily, in an older PokerStars blog post made by Jorgensen back in 2010 he was very concerned about the possibility of being the victim of a robbery after a friend of his was robbed in his home. Jorgensen’s blog post went on to say that he had taken a number of measures to secure himself and his family, including installing alarms in his home and not keeping large amounts of money at home.